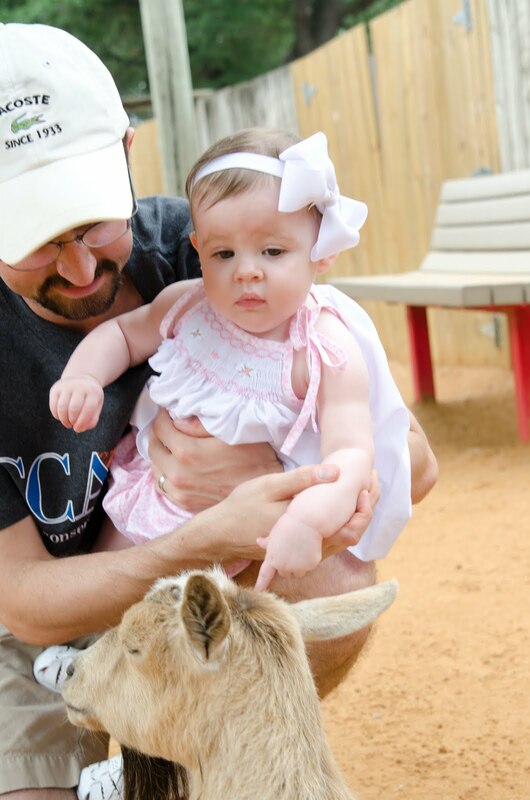 Yes, that's right, my kid hates goats. Innocent little sweet petting zoo goats. 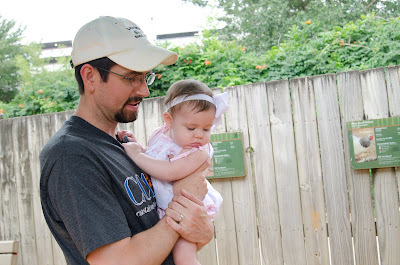 This past week Alex and I have been talking about taking Kate to the Houston Zoo - specifically to the petting zoo - as she is increasingly aware of our dogs and always wants to pet them. We stupidly eagerly assumed this meant she would want to pet all soft, cuddly, living creatures. Because, you know, goats are the epitome of cuddly living creates. We were (are?) dellusional. 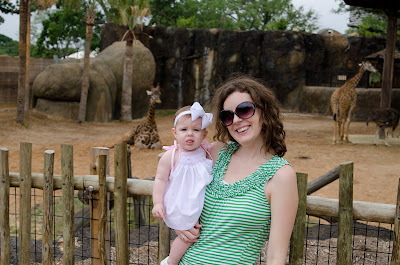 After Kate got sick, we decided to see how she was feeling Saturday morning and then decide if we would still go to the zoo. She woke up bright and early acting like her normal self so we kept our plans. Alex and I were way too excited about the whole petting zoo thing. I'm talking, got to the zoo as before it opened to avoid crowds, excited. I was so excited that I forgot my wallet, membership card, and ID. Thankfully a nice zoo worker let me pay $3 for replacement cards and didn't charge us the insane price for the zoo (seriously, why is it ok to charge a family of 4 almost $40+ to get into the zoo?). We got back to the petting zoo 3 minutes before it opened. Perfect - no crowds, just Kate and some goats. Yes, only goats. Apparently that is the only animal children in Houston want to pet? Well, that's what the zoo thinks at least. Kate didn't cry, she just had a really sour look on her face and a death grip on Alex. Almost like she was utterly disgusted we would even contemplate making her touch animals. After about 5 minutes, Kate realized we were persistent and we weren't going anywhere until she touched a goat. But, we really wanted to see if she would warm up to the animals once she got on their level and felt that they were soft and similar to her puppies. This was the best we got. I'm pretty sure Kate is thinking "Fine then, I'll touch this disgusting thing with one finger. Ok? OK? Now get me out of here. 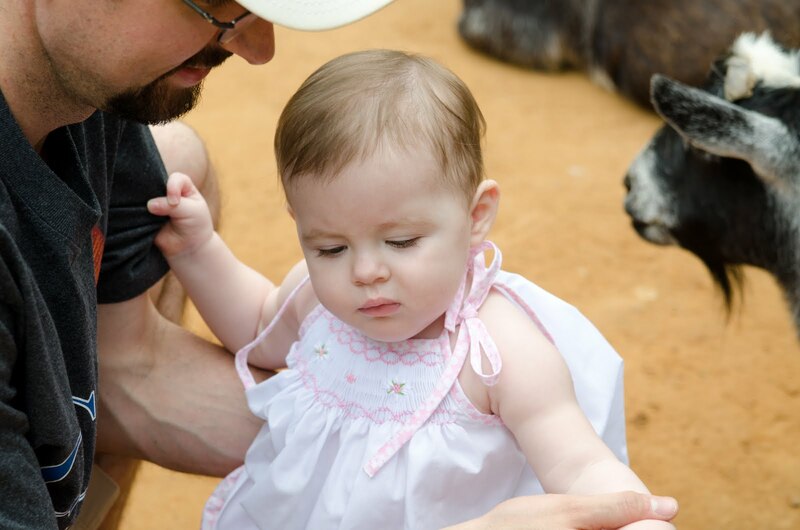 NOW"
As soon as we were on the outside of the petting zoo Kate was happy and talking/ smiling at the goats. Lesson learned. My child prefers animals to be behind fences. We weren't at the zoo much longer after the petting zoo fiasco. 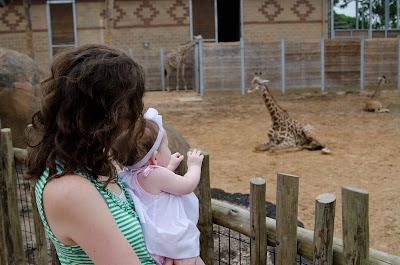 We quickly walked through Africa to see the giraffes and the chimps. It was so hot and humid - my hair is evidence of that. We headed to an indoor exhibit to cool off a bit before heading home. Kate loves fish tanks so much. 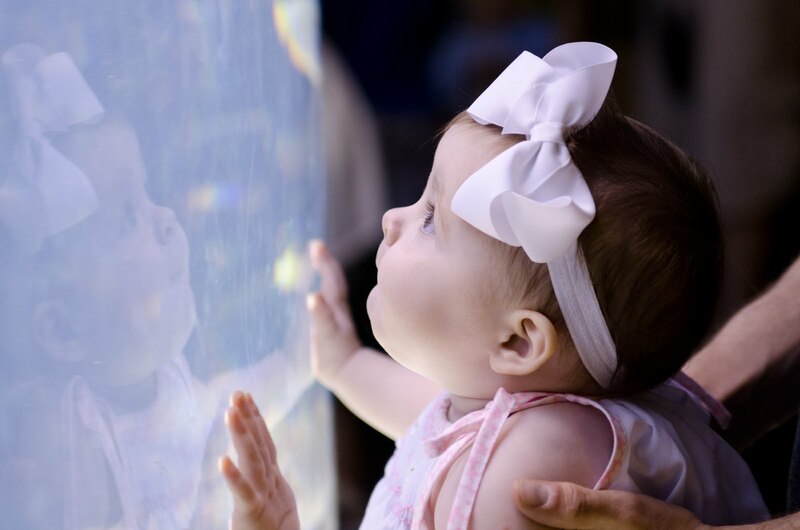 We need to make a trip back to the aquarium! Being outside in the heat was just too much for a recovering Kate. 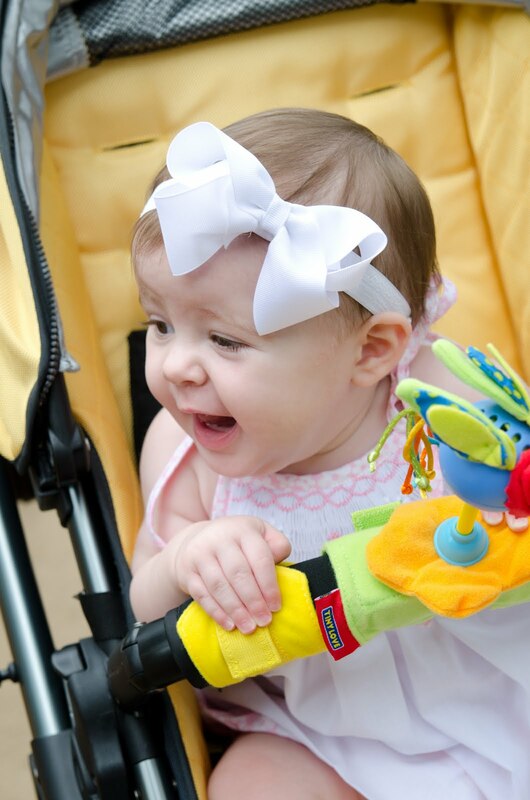 I feel horrible that we took her out because the heat made her diaper rash worse. I'm so glad we have a zoo membership because it makes quick visits to the zoo ok! On a different note - be sure to click on over to my giveaway blog - big things are happening over there and I already have 4 giveaways lined up!! I seriously laughed out loud at the "one finger" pet. And I love the pics of her at the fish tank. She's such a cutie! Your title and the "one finger" pic and description had me dying laughing. Hilarious! Hopefully Kate is feeling better now. I'm so glad that we got our zoo membership and C.orben loves the aquarium as well. It's so much fun watching these babies learn and explore :). Baaahaaahahaa! That's just too funny. Maybe Kate is channeling her inner Lala - and thinking about Lala's adventures with goats! Baaa Haa Haaa! That was too funny. Maybe KK is channeling her inner Lala and thinking about Lala's adventures with goats! 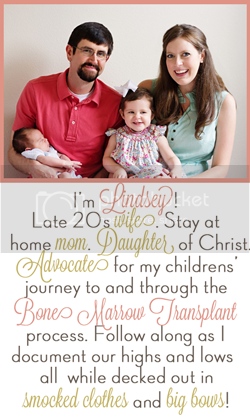 Great pictures and story, especially the one finger picture - SO funny! I LOVE the expressions on her face, she's so cute! The one finger touch is hilarious! Hahaha!! That is hilarious. The looks on her face are priceless! HAhahah! I love that picture of her touching the goat with her one little finger! 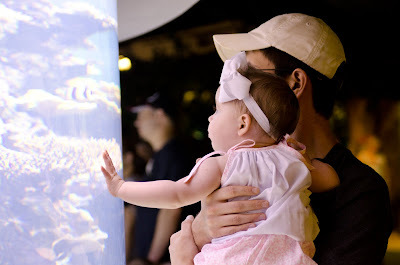 And the one of her with her Daddy at the aquarium is so sweet! And I agree-Zoo prices are so high! It's $50 for a family of 4 at ours. Ugh.